Breakfast or dinner - our Crowd-Pleasing Casserole can go either way. Made with broccoli, ham, cheese and eggs, this versatile one-dish baked casserole is sure to please. 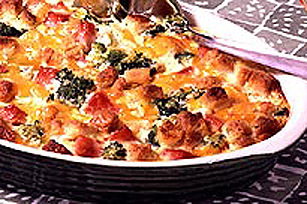 COMBINE in a baking dish broccoli, ham, cheese and croutons. MIX together eggs, milk and Miracle Whip. Pour over ham mixture. Refrigerate for 30 minutes or overnight. BAKE at 375°F(190°C), uncovered, for 1 hour.